At least 11 people have been injured in an incident involving a car ploughing into pedestrians outside London’s Natural History Museum. One man has been arrested at the scene. The incident has been declared not to be terrorism-related. According to the London Ambulance Service, 11 people were treated after the incident, with most of them suffering from head and leg injuries. Nine of the injured were taken to the hospital. The incident occurred at 2:21pm local time, according to a statement by the Metropolitan Police. Mayor Sadiq Khan said counter-terrorism police are investigating any possible extremist links. “Details are still emerging and I have spoken with and am in close contact with assistant Met commissioner Mark Rowley [head of UK counter-terrorism policing] and our other emergency services,” he said in a statement. “There has been an incident with a vehicle mounting the pavement and hitting a pedestrian. It happened on Exhibition Road. Police are dealing with the incident,” said a spokesperson for the Natural History Museum, adding that while no-one was being allowed into the building, visitors were being let out through a side exit. 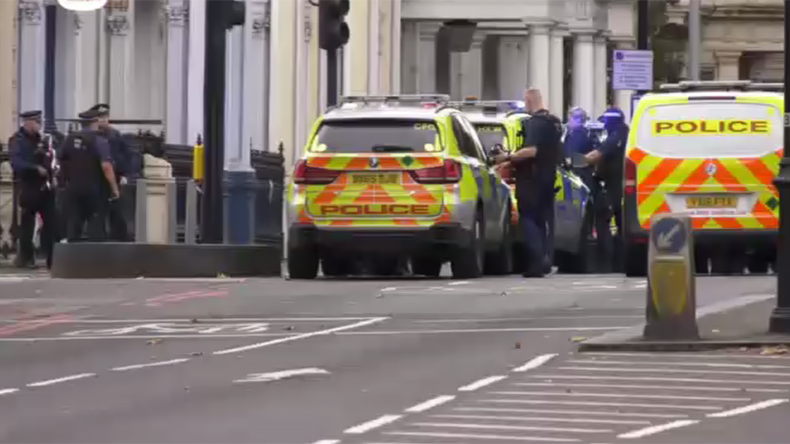 The incident was being treated as a road traffic collision and was not terrorism-related, London police said in a statement. The UK’s official terrorist threat level has been set at ‘severe’ following several extremist attacks in London and Manchester this year. London has already suffered three vehicle-ramming attacks this year. The first took place on March 22, when a radicalized British man ran over pedestrians on Westminster Bridge, then went on a stabbing spree outside Parliament, killing five people. In the second attack on June 3, three terrorists ran over pedestrians on London Bridge before attacking bars and restaurants in nearby Borough Market. Finally, the third attack took place on June 19, when a van was driven by a white British male into a crowd of worshipers outside Finsbury Park Mosque, killing one. In the first two cases, the attackers were killed by responding officers.